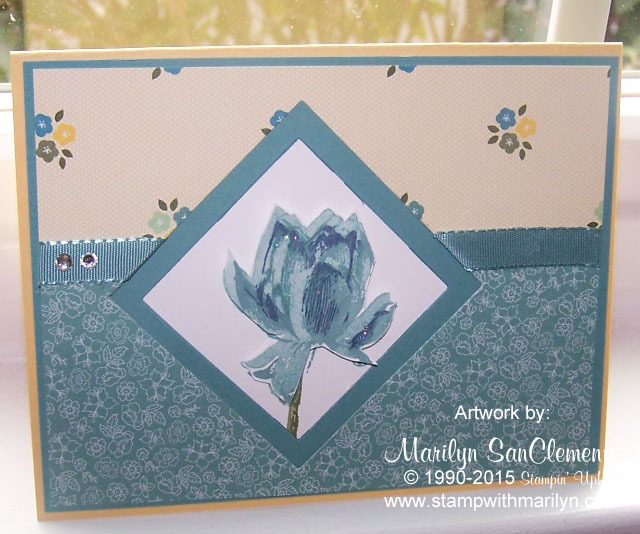 Marilyn SanClemente March 19, 2015 March 19, 2015 Sale-a-bration, Stampin' Up! Today I have another Lotus Blossom card to share with you. Since Sale-a-bration is winding down (2 weeks left) I thought that I would post items using the SAB sets to inspire everyone! So this card uses the same sketch as the Lotus card that I posted on Monday for the Mojo Monday sketch challenge. One of my friends was looking at the Lost Lagoon Lotus card that I made on Monday and really liked it. 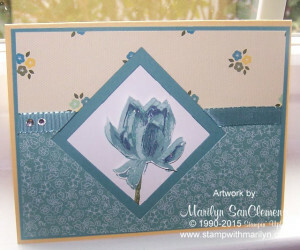 She is a new stamper so I showed her how to use a sketch to create a card. As any of you know, sketches are my favorite way to create cards. Then I just pull out a Designer paper that I like, the coordinating cardstock colors and choose a stamp set that has an image that fits with the shape of the sketch! On Monday I made this card using the All ABloom DSP paper stack. The Red lotus blossom card was made using the Stacked with Love DSP paper stack. When I was stamping the Lotus blossom, I had a stray little mark. So I was planning to re-stamp the image and was told to leave it. 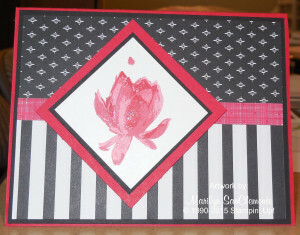 This card has an Asian feel with the black and red colors and it is Asian custom to leave stray marks. They are considered part of the card and meant to be there. So which one do you like better?? If you haven’t had a chance to see it, watch the VIDEO that I recorded for this sketch/card challenge.